Piano Sonata No.3 for piano solo Op. 82 (2002) c.16'00"
Piano Sonata No.3 was commissioned by the American Pianists Association for pianist James Giles who premiered the work on April 11, 2003 at the Indiana Historical Society in Indianapolis. “There is no question, however, that Lowell Liebermann's Sonata No.3 Op.82 is of a very different magnitude to the other new works played in this recital. Its scale is breathtaking, its drama evocative and its lasting place in the repertoire imperishable. Liebermann's largest solo piano work to date, and his first piano sonata for 20 years, it has all the typical elements of lyrical brilliance and formidable virtuousity which were hallmarks of his two, incandescent piano concertos (recorded by Stephen Hough for Hyperion)...It is a magnificent work." 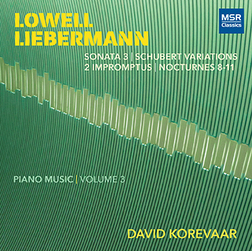 "Lowell Liebermann's Sonata No. 3 is a gritty pianistic challenge. Composed four years ago, it is driven by rhythmic impulse and tempered by soaring lyricism. "